Using your computer as part of a home theater? This may make controlling it much easier! Personal computer systems may no longer be the large ugly beige boxes they once were, relegated to an unobtrusive spot in the spare bedroom or basement. Rather, today’s slickly styled PCs are finding their way into more non-traditional places – such as the living room. As part of the “convergence” trend spreading throughout the electronics industry, a specialized new breed of computers has been created, called “home theater computers”, or HTPCs. Whether a purpose-built system designed to blend in with other electronics equipment or a generic system plugged into a television, HTPCs are generally bought with one of two distinct capacities in mind. First, there’s the supplementary home theater computer system, added to support a “real” television, DVD player, receiver and other components. Here, the computer would likely exist as a way to surf the internet, play big-screen games and catalogue DVD movies and CD albums, all from the comfort of a sofa. Second, there’s the user who doesn’t already have a complete home theater system. In this case, the computer itself may serve as television, DVD player and VCR – in addition to its normal functions. A central part of any decent home theater computer is a multimedia-oriented video card. Depending on a user’s specific needs, such a card may have TV-out, video-in, a TV tuner, DVD playback capabilities and fast 3D graphics. ATI’s “All-In-Wonder” line of cards match those specifications exactly and, on more recent models, have been bundled with a very interesting little addition: a remote control. Although all home theater PC users will need some way to control the computer fully – such as an infrared mouse and keyboard – the second kind of user described above, whose PC is the theater, may desire something more familiar for standard viewing functions... something like the ubiquitous remote control. With that thought in mind, in steps the All-In-Wonder’s wireless Remote Wonder. From bundled accessory to standalone packaging. Initially only available with the All-In-Wonder line of video cards, ATI has begun selling their remote as a separate item that can be added to any computer system, regardless of its specific components. 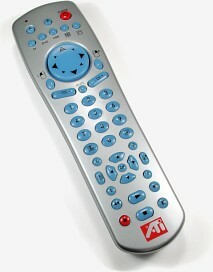 Available at a USD MSRP of $49, the ATI Remote Wonder is an RF remote control designed to help individuals operate a computer just like familiar audio/video components. The X-10-manufactured Remote Wonder isn’t the only PC remote control available. Creative Labs includes an infrared remote with some of their better Audigy models, while many DVD, HDTV and TV tuner cards also include remotes of their own. 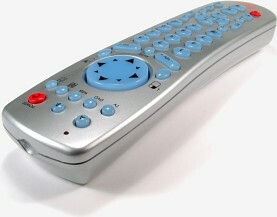 Currently, the Remote Wonder is one of only a few computer remotes that are available separately, without additional hardware purchase. From a distance the Remote Wonder looks just like any other remote control. It’s not until viewed closer that certain differences appear... such as the large 8-way disc used to control the mouse cursor, the lack of any IR emitters up front, and a whole range of unfamiliar button icons. Physically, The Remote Wonder measures 8.1" long, 2.25" wide and 1.75" thick (20.7cm by 5.7cm by 4.5cm). Despite its relatively normal footprint, the unit weighs in below average at just 6.0oz (170 grams) with batteries, or 4.7oz (130gr) without. Weighting is good, with the balance point almost exactly dead center. The case’s plastic is thick and sturdy feeling, but no screws are used to hold the two halves together so a minimal amount of lateral twisting is possible.